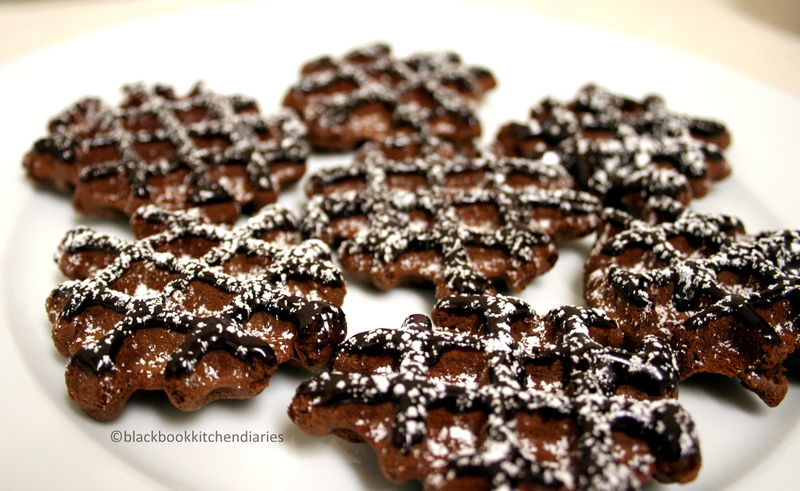 These are really fun to make if you have a waffle iron. They are not as light as your conventional waffle, but rather a little bit dense with a touch of crunch. 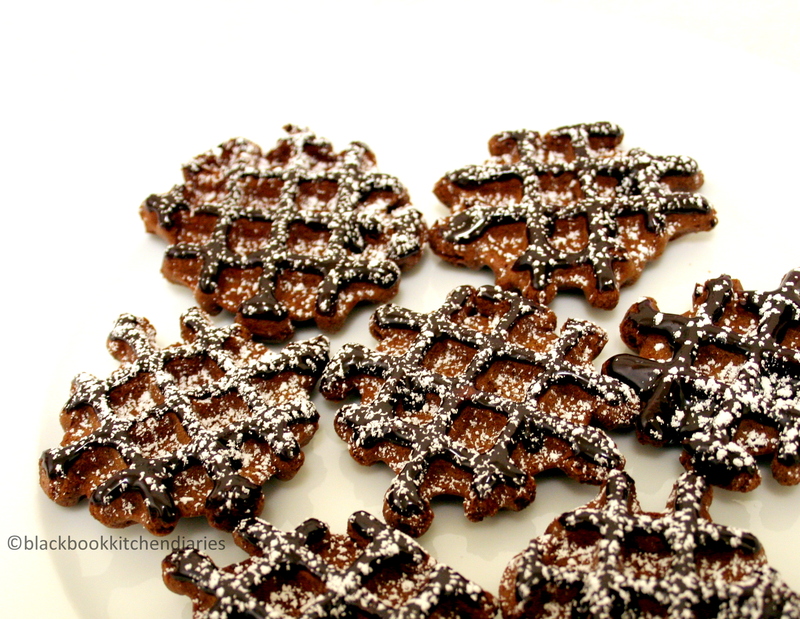 I usually like making this around the holiday time; and these cookies makes really good gifts for friends and family. This is one of my favorite cookie recipe from Martha Stewart. I just love how easy it is to put together. Instead of using my electric mixer as directed, I simple place all the ingredients in my blender and blitz away. Then let the batter rest for 30minutes in the refrigerator before using. You can pretty much try this recipe with different variation besides chocolate, I have recently tried one with vanilla and also some cinnamon and nutmeg and I have even tried a pumpkin spice version. It’s all very delicious. Personally, I love this one the best. (big surprise right?) The chocolate makes this somewhat dense. Try using a good quality cocoa that will bring out the flavor of this babies. Don’t skip chocolate glaze; it’s the best part and really makes a lot of difference in flavor and the appearance of this cookie. 1. Melt chocolate with 1 cup butter (2 sticks) in a saucepan over medium-high heat, stirring constantly. Let cool slightly. 2. Put eggs, vanilla, and granulated sugar in bowl of an electric mixer fitted with the paddle attachment. Mix on medium speed until pale, 4 to 5 minutes. Mix in chocolate mixture, salt, cinnamon, 1/2 cup cocoa powder, and the flour. 3. Heat a waffle iron until hot. Lightly coat grids with cooking spray. Spoon about 1 tablespoon batter onto center of each waffle-iron square to make 1 1/2-inch rounds. Close cover; cook until set, about 1 1/2 minutes. Transfer to a wire rack, bottom sides up. Let cool completely. Repeat with remaining batter, coating grids with cooking spray after each batch. 4 .Melt remaining 2 tablespoons butter in a small saucepan over low heat. Add confectioners’ sugar and remaining 2 tablespoons cocoa powder; stir until smooth. Stir in milk. 5. Gently dip 1 surface of each cookie in icing so that just the waffle lines (not gaps) are coated. Repeat with remaining cookies and icing. Transfer to wire racks; let stand until set, about 10 minutes. Dust iced surfaces of cookies with confectioner’s sugar. Cookies can be stored in single layers in airtight containers at room temperature up to 2 days. I think I could do this! I have seen these cookies but never really knew how to make them! They look delicious – I could definitely see them as a holiday treat! Lovely post! On my to-buy list: a waffle iron. These are really beautiful, and I can imagine they are a HUGE hit around the holidays. Thank you for sharing one of your favorite cookie recipes…I can see why you like them so much! Chocolate! Never go wrong with it! I’ve never made nor seen these before. They are lovely and delicious looking. Thanks for introducing me to them! Looks beautiful! We got a waffle iron for the wedding, but it’s still at my in-laws because I can’t fit it in my tiny kitchen! Ugh! Ooo, I just love these. You’re right, they are so cute!